The Kromatron (designed and built by Craig Dorety [maker of the komegatone] with assistance from Devin Becker) is a dynamic MIDI controller built specifically to interface with modern audio performance software such as Ableton Live. It has 4 knobs, 2 faders, a two-axis joystick, and 8 buttons. The device is 100% configurable and can change settings while the user is playing it. I call it a Meta-Instrument, because it holds 128 performance presets that can be activated by a simple MIDI patch change or program change signal. One moment the user can be playing a piano sound, the next the user can be scheduling audio loops or controlling effects parameters. There is really no limit to what the user can set this device to do. 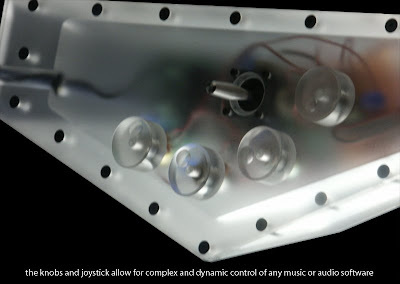 This controller has built in LEDs that correspond to each input. In other words, if the user turns a knob, an associated LED gets brighter, or if the user pushes a button, the button lights up.